For anyone going to sea, this one-day Sea Survival course provides an understanding of how to use the safety equipment on board your boat. This course is a genuine lifesaver. Although sailing is one of the safest leisure sporting activities and most of those afloat will never have to use their liferaft, this is essential training to have in the event of an emergency at sea. The course will cover preparation for survival, life jackets, medical issues and search and rescue techniques. It includes a practical session in a swimming pool to experience entering an inflated liferaft whilst fully kitted out. You will need to provide wet weather gear. Ocean Discovery will provide lifejackets, but you are welcome to bring your own equipment. The course is a great opportunity to practice the use of your own lifesaving equipment. Please bear in mind that the clothing must be clean enough to be worn in the swimming pool. Our instructors will bring their unique experience and insights which they have gained from over 20 years of practical sailing around the world. You should leave the course with a good knowledge of survival techniques, the safety equipment carried on small boats and experience of practical drills in a liferaft. If you wish, you can bring a pen and paper to take notes but you will be given the Sea Survival Handbook, as part of your course. Please note this course is non-residential. If you would like to arrange accommodation nearby, there are a few suggestions here. 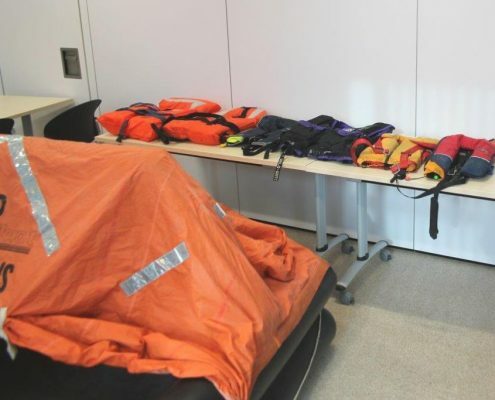 You should leave the course with a good knowledge of survival techniques, the safety equipment carried on small boats and experience of practical drills in a liferaft.